March 25th in WordPress Themes by Wordpress Jedi . Top viral sites get a ton of traffic on a daily basis. Many of them use advanced algorithms, interactive tools, and other technologies to keep their visitors coming back for more. If you have something unique to offer, you could always create your own viral content site. Bunchy is an attractive theme that lets you do just that. This theme is powered by Snax. It lets users create open lists. Your members get to vote on submitted posts and lists. Bunchy comes with social sharing buttons, up/down buttons, and popular/hot/trending posts badges. It is powered by MashShare plugin. 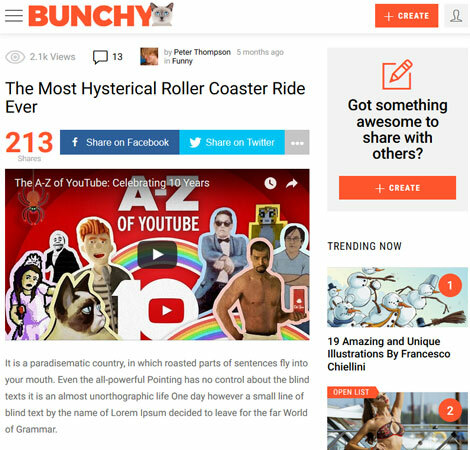 Bunchy lets you monetize your content through ads. It is responsive and ready for retina displays. It also works for RTL sites. Your visitors can submit list items with images, GIFs, and videos. This is a commercial theme by an Elite Author.